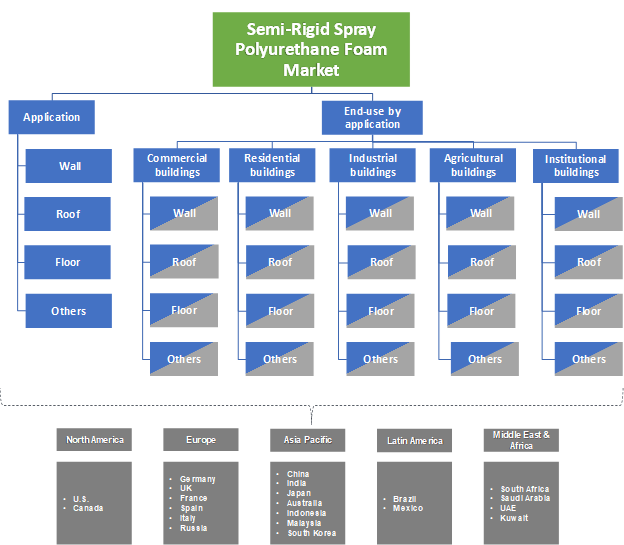 Semi-Rigid Spray Polyurethane Foam Market size was estimated over USD 700 million in 2017 and the industry will grow by a CAGR more than 6.5% up to 2024. Steady growth in North American construction sector will spur the semi-rigid spray polyurethane foam market growth over the forecast time frame. Steady recovery from economic slowdown coupled with the stable GDP growth will be the chief reason behind the North America’s construction industry growth. The product is widely used for resistance, sealing and insulation purpose in roofs and walls of various infrastructures and buildings. Semi-rigid SPF helps to reduce the overall energy requirements for cooling and heating by filling the gaps and cracks in the building. In North America, the U.S. construction industry has been witnessing a steady growth in the last few years. Construction spending has been increasing at a healthy rate owing to a rise in private construction projects across the country. The U.S. construction spending increased from USD 787.9 billion in 2010 to USD 1,181.5 billion in 2016 and is likely to witness further gains in coming years. This trend of increasing construction spending will spur construction activities in the country, which will further boost the semi-rigid SPF demand for use in insulation and sealing. 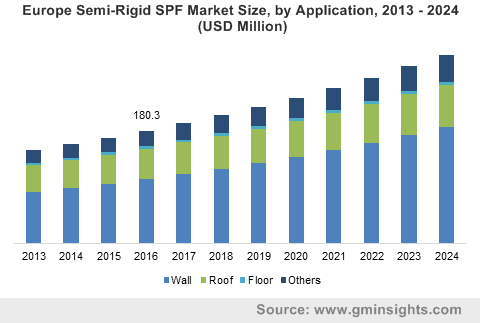 Oscillation in the raw material prices and health issues related to manufacturing of the product are the key restraining factors which will hamper the semi-rigid spray polyurethane foam market in forecast period. Basically, the product is manufactured from crude oil derivative products and the continuous changes in the crude oil prices will have significant impact on the prices of the product. Crude oil cost was USD 128.94 per barrel in July 2008. By July 2009, the price fell to USD 63.42 per barrel, a decline of over 50%, followed by a steady rise till the latter half of 2013 & again fall further in 2014. The unpredictable pricing trend has been prevalent in the market and is expected to continue in future. Prices of MDI and TDI have been adversely affected due to high volatility in prices of crude oil. The volatility in these essential raw material prices has led to obscure profitability forecast for investors, thus restraining the semi-rigid spray polyurethane foam market growth. On the basis of end-use, the semi rigid polyurethane foam market is divided into residential, industrial, commercial, institutional and agricultural buildings. From these, the institutional buildings accounted for close to a quarter of the market in 2017 and is expected to grow at a slower pace by 2024. Semi-rigid spray polyurethane foam is basically used to fill the gaps on the walls, attics, etc. in new as well as old structures which find applications in schools, colleges, and government buildings such as museums, libraries as a sealant and insulator. Commercial buildings segment will grow by 6.5% year on year during the forecast period. Substantial usage of this product for insulation and sealing of shopping malls, hotels, and corporate structures due to its extreme heat and water-resistant characteristics, will drive the demand of spray PU foam. Also, this material reduces the overall utility bills and construction cost. The semi-rigid SPF industry is divided based on application, which include floor, wall and roof and others. The other applications include attics, plumbing systems, ceilings. Among these, walls accounted for over 50% share of the market in 2017 and is set to grow at substantial annual growth rate by 2024. This is due to the extensive product usage to cover and fill the gaps and cracks on the walls. The product also offers several benefits; for instance, it expands 100 times to its original volume, provides superior air barrier facility, and also enhances the water adsorption property up to 40%. In 2017, roof application segment generated revenue over USD 190 million and is projected to grow at a steady rate over 2018 to 2024. Significant demand for energy efficient and eco-friendly buildings with superior resistance to the regularly changing climatic conditions are the key driving factors for the segment growth in forecast period. Germany and UK are major markets in the semi-rigid spray polyurethane foam business and collectively accounted for more than 35% share of the Europe in 2017. This can be attributed to the supportive government regulation and increasing demand for energy efficient infrastructure in the region. In Europe, buildings accounted for more than 40% share of the entire energy consumption and also produces close to 35% of the greenhouse emissions. This will be the key factor for the industry growth in coming years as the product is majorly used to reduce the energy consumption. Asia Pacific accounted for around a fifth of the entire semi-rigid SPF market in 2017 and this share is expected to rise in the forecast timeframe. China and Japan will lead the Asia Pacific industry owing to the significant construction activities in these countries. Although the eastern Asian countries will have comparatively lower share, the annual growth rates will be higher due to greater potential for market penetration. Global semi-rigid spray polyurethane foam market is characterized by the presence of various large scale and small-scale producers. Some of them include BASF Corporation, Gaco Western, Lapolla Industries, Inc, NCFI Polyurethanes, Honeywell, Icynene, Rhino Linings Corporation, JJD Urethane, Demilec, Premium Spray Products, The Dow Chemical Company, International Cellulose Corporation, Mitex International, Foam Supplies, Henry Company, CertainTeed Corporation, and Specialty Products Inc. Most of the companies are engaged in mergers, acquisitions and joint venture activities in order to expand their presence worldwide. For an instance, in July 2014, BASF announced the acquisition of Polioles’ PU business activities. Polioles operates in the field of performance materials, isocyanate, PU-systeme, polyurethanes, and polyol. This in turn will enhance the entire product range of BASF& increase its presence globally. Semi-rigid spray polyurethane foam is a chemical product, mainly produced by polyols, isocyanate, etc. and commonly known as open cell spray polyurethane foam. The market will be primarily led by the construction sector growth, specifically in North America and Asia Pacific. It is basically used for insulation and sealing on the exterior and interiors of building due to their superior structure and inherent properties. Growth in commercial and residential building construction in North America and Asia Pacific, coupled with increasing infrastructure restoration activities, will spur the product demand. Supportive protocols and energy conservation norms will also create a huge opportunity for market penetration in coming years.